Before 1941, Stephenville was a small quiet village with approximately 500 residents. This was soon to change. Once the United States Air Force decided that Stephenville would be a vital refueling stop for aircraft en route to Europe. "In 1941-42 the community of Stephenville was transformed into a boom-town when, almost overnight the population increased to over 7,000 people, most of whom were engaged in the base construction." Thirty-two years later. The American Air Force has been here and gone. However, an extensive arrangement of buildings remain in the town of Stephenville. Today, the town uses such buildings for major recreational, commercial and housing operations. Over 4,000 soldiers were stationed on the Stephenville base and each year approximately 132,000 military personnel passed through the Harmon Base. At a cost of two million dollars each, the two Harmon Hilton dormitories were built in the centre of the base, both reaching seven stories high. 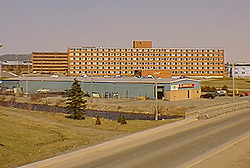 Today, the Harmon Hilton dormitories make up the Stephenville Manor and the College of the North Atlantic headquarters and residence. 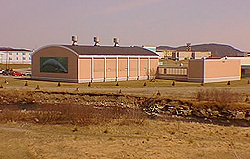 Stephenville Manor and behind The College of the North Atlantic Headquarters. All of the Harmon duplexes and apartments on Stephenville's "base", as it remains known today, were built for officers with families. Various buildings were built to house the other civilians. Some of these buildings are: Building 501, all female nurses; building 502, coed teachers and officers; building 503, male teachers and officers; and building 505, families. 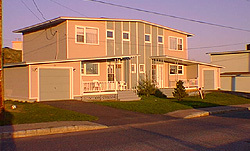 A typical duplex built for officers with families. Now owned with pride by Stephenville families. Recently, the numbers were removed from the buildings. Some of these buildings are known today as the Warmbrook Apartments, Russell's Apartments and Jack and Jill Nursery School. The Hotel DeGinque, today's Stephenville Hotel was used as a dormitory for transient officers and visiting dignitaries. Among the living quarters there was a basic department store constructed to meet many everyday needs of the civilians. It was called the " BX store", and is today's Harmon Mall which is comprised of a Sears outlet, a Trading Post and a few other small businesses. The Base Commensary was constructed - a common day grocery store. Today, this is the Stephenville Co-op store, the original building underwent major renovations in the late 1980's. Also, a large chapel was constructed called the Base Chapel. It accommodated up to 1500 worshippers of a wide variety of religions and faiths per week. Today the old Base Chapel is the Zion Pentecostal Church . Throughout the duration of the Harmon Air Force base, a wide variety of recreational facilities and clubs were constructed. This was important in playing a role in the entertainment and relaxation of the US Military and Newfoundland civilians. A lounge was set up for all those who lived and worked on the base, called the Caribou Club. Liquor and entertainment were provided at cheap prices. There was over 1,000 members. This is today's Caribou Curling Club, a building which provides a curling rink and a lounge area where many Stephenville residents enjoy banquets, socials and annual curling spiels. In 1948, and exquisite Airmen's club and in 1950 an Officer's club were constructed. These clubs were much the same as the Caribou Club, but for specialized personnel only. 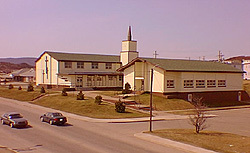 The Officer's club is Stephenville's Royal Canadian Legion. The Airmen's Club, is Razoolies, the most popular night club in the Bay St. George area. In 1960 the Harmon Theater was built, with a seating capacity of over six hundred and a large screen and a stage used for movies and live performances. Presently a popular spot for the hottest box office hits. The civilians fitness was also an issue. Therefore, many outdoor fields were cleared and developed, team sports became a popular summer activity. In 1956, a huge gymnasium was erected, called the Base Gym. It had a seating capacity of 500, four wall courts, and two squash courts. Today, the Base Gym is used for various sports such as basketball, badminton, Tae Kwon Do, weight training and squash. The gym will be used for the Judo competitions in the 1999 Canada Winter Games. Presently in use as a community sports and recreation centre. When the Harmon Base closed down in December 1966, its real estate holdings were worth one hundred and seventy-nine million dollars. All of the buildings were turned over to the federal government.